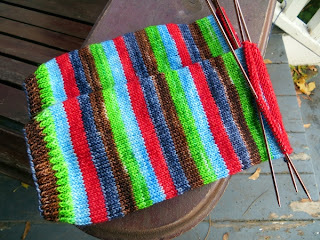 I wonder whether you've ever knit away on something - almost absent-mindedly, and only for a few minutes every day or two - and then suddenly noticed it's almost all grown up? A pair of sock legs, both of them nicely onto their heel flaps. 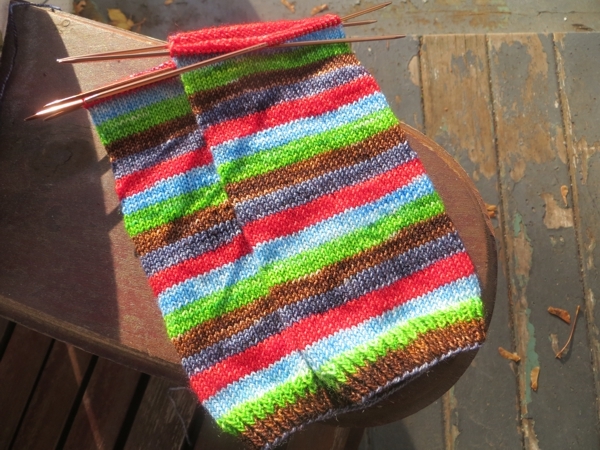 The nice thing about top down socks for smallish feet is that once you're done the leg, there's not a lot left to worry about. After the tedium of a plain leg, heels feel like you're inventing something a lot more exciting and delicious than sliced bread. After that the gusset offers the rewards of two fewer stitches every other round, and by the time you're starting to get bored of plain old foot knitting, you're onto the toe. Even the sun wanted to shine on these things. I'm beaming at them myself. Also, a little curious as to what is going to be my travel knitting until after I get the gussets well in hand, because every time I try to take something this porcupiney out of the house I lose a needle, and these ones are not replaceable. Maybe I should start another cowl? Hope you had a super productive weekend and I'll see you tomorrow!